One can find this typical type of archtecture in the regions of the Bougès, Mont Lozère, Margeride and Aubrac. The granitic regions are allied with the Causses and Cévennes by a long history and culture in common. 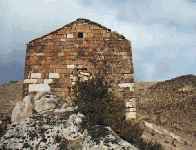 Within living memory it has been the summerdestination of all the southern flocks, the so-called 'Transhumance': the traditional sheep-removal of the Languedoc. The Mont Lozère and a part of the Bougès are two granitic chains of mountain parallel in east - west direction, separated by the Tarn in the south of the Massif Central. Average height between 1000 et 1400 meters culminates with seventeen hunderd meters (1699 m. if you like precise figures). Isolated farms, hamlets and villages are constructed on a rupture of the rock, situated if possible nearby pastures, earth to cultivate and a source. Often the water of the spring at distance is conducted by hewd or built and paved canalization. Because of the severe winters when the snow might stay for several months the buildings are also interior in communication with each other, this in contrast with the lime- and slatestone architecture of the Cévennes. the "four banal",a very big bread-oven with benches inside for meetings during periods of bad weather. The granite house is relatively low because of the heavy material which is hard to handle. The rooms are voluminous and compact with less openings and a more extensive groundplan than lime- or slatestone houses. the first floor contains the hay- and strawloft and later in history sleepingrooms above the kitchen. sometimes, depending of the slope of the rock, beneath there are cellars. In the kitchen, the 'living' is a large arch overstraining the whole breadth carying the monumental chimney, were-in also the opening of the bread-oven and the dresse. The opposite gable separating itself from the stable or workshop. Beneath the pavement made out of big flat granite stones "les barres" there is drainage installed for the thrickling water of the rock. The kitchen and stable next to each other in prolongation ("en barre") or in angle, depending of the slope, are separated by a wall or a wooden partition for the poor ones - agricultures without land. In winter, the cattle stays 6 months inside in case of persisting snow and can be fed by the trapdoor to the hayloft. Longtime people slept in the kitchen at the ground or in cupboard-beds. The traditional thatch of this region is made out of straw of rye. Little by little it has been replaced by slate but still some roofs have the big stones at the façade-walls which fixed the rye-straw, like le Mazel, l’Hôpital, la Vialasse and Bellecoste. 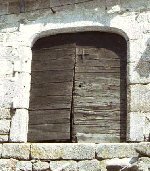 the hayloft has always a door at the high side of the mountain open directly on to the threshing-floor and at the main façade there is always a second opening to create draught for threshing inside in winter. The agricultural economy in regression consists of bovine cattle-breeding during the whole year and ovines in summer. Stones are usually taken on the spot; granite is not dugged in strata like lime- and slatestone but in massives stones of very variably size of the so-called chaos. Some are include in buildings like that, others are split or even worked up more. The stone-cutter knock on the round granite stone all over in order to hear it's weak points; at the wanted spindle he alternately drives his chindles deeper by ear. When the boulder is ready to split he suddenly change of sound and cuts perfectly in two. The colossal walls between 80 cm and 1 m.30 are constructed "a fruit": broader below as above with a decrease at each floor. 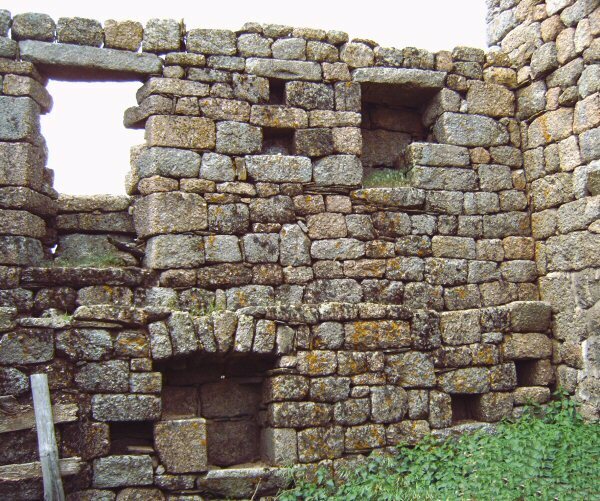 The walls of rich farms such as MAS CAMARGUE, RUNES and L’HÔPITAL.are joined allBondons region, cutted stones over the wall by big cutted transverse stones. But more often the walls are made out of two loose walls with only here and there junction-stones filled up with ‘tout venant’: all kind of uncutted stones. The junction in the oldest walls is made by cutted irregular but perfectly fitting stones:‘opus incertum’. A granite house has got very few and very little openings, which gives the idea of protection. A door, a window and a very little window in the living room, and some very little windows in the huge stable. The openings are grouped in the main façade, usually eastwards. 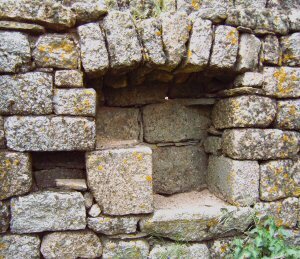 Because the most of the houses are integrated in the rock itself at the northside, with their gable wall to the south, there is a door open into the ground level at each floor. The lintels are made out of one cutted stone, or arches out of two, tree or five tapering stones, very beautiful. The extension of the farm is realised at one or both sides of the existing building in the same direction or perpendicular at this one; this depends of the natural inclination of the slope. At the stable-side serves as an annex for animals, tools or engins. At the kitchen-side there can be incorporated the oven if it's not built already at the same time. The prosperous farm of ‘L’-form can be closing a courtyard with a gateway by adding new buildings. If you look around the farm and some further in the landscape you can distinguish a lot of architectural elements. Although a lot of constructions are purely made for practical reasons to this autartical life, the methods, material and functionality makes it all without exception aesthetical juwels. Demands, period, material, fashion, prosperity, required pace and the personnal tinge of those who've realised the work gives every construction her own personnality. 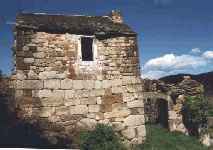 The "Ecomusée du Mont Lozère" offers you a very good occasion to visit the granitic patrimony; walks, interesting sites and musea. Offer yourself the charm of this beautiful architecture in it's landscape, there were it has been created. The fortified village La Garde Guérin above the gorges du Chassezac represents a particular example of well conserved mediaeval architecture. This place as well as it's surrounding are a visit worth. Le chemin de la Régordane ( the GR72) was made in the XII th century for economic exchanges between the Auvergne and the Velay in the north and the Languedoc and the Mediterranean. This castle like several others (Montfort, Portes) and a lot off fortified villages were asking toll to pass the "Régordane",very useful at that moment to be protected for the numerous highwaymen. MONTGROS, GRIZAC (château de Grimoard), LE PONT DE MONTVERT, LES BADIEUX, LA BOULADE, ROUSSES, BELLECOSTE, LES URFRUITS etc.